The ballot boxes have been collected, the votes counted and the winner is in. So, without further ado I can reveal the title of my new book as chosen by you will be (drum roll). Here's a screenshot of the complete survey results. As you can see that pulled 50% of the entire vote with the next nearest polling less than half that so the victory is pretty emphatic. Why did I go to the time and trouble of setting up a survey and sending it out for people to vote on? Why not just choose the title I thought would be best. There are two very good reasons for this. Here’s the first. Take a look at these business book titles. Titles and headlines are crucially important in your marketing. A big part of the success of these best selling business books is using titles that stop you in your tracks and make you want to learn more. In most cases here they’re using curiosity or the promise of a great big fat benefit to you the reader to do this. 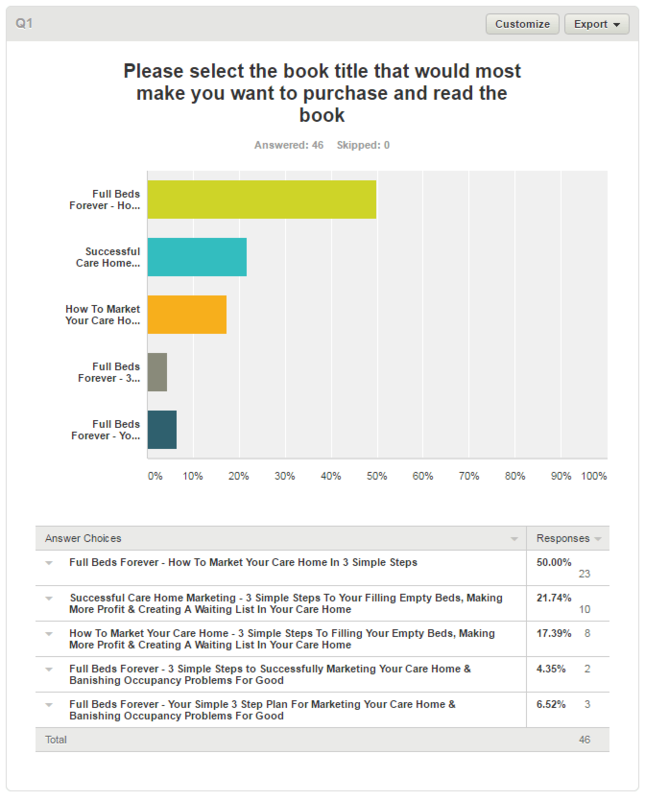 Getting you to stop browsing and take action is the start of the book purchase process. The same is true of any marketing material that you put out about your care home be it an advert, blog post, message on your Facebook page, email or the words you use on your website. The headline or title needs to capture your potential readers attention, pull them away from what they’re doing and then persuade them that it’s worth reading more. In the book I show you exactly how to do this using a specific formula that you can use over and over again. You can use it to write a successful advert or indeed any marketing message for your care home. I also give you loads of examples to get you started. The second reason for asking you what the best title is that I simply don’t know what title will resonate best with a potential client and purchaser of the book. And the only way to actually find out what will is to ask. This is a universal truth in marketing and applies to everything. If you charge £500 per week for a place in your home and the person stays for 3 years that person is worth £78,000 to your business. Using a great headline in an advert can be the difference between getting 1 enquiry and no sale or getting 4 enquiries and filling 2 beds in your home. That’s either £0 revenue generated or £156,000! So it’s worth spending time on headlines (and your marketing in general). It really can be the difference between stumbling along trying to scratch a living from your business and lifelong success and recognition. Remember, you are not your customer. To find out what they want ask them using surveys or split testing and tracking your advertising and marketing results. Do you want a copy of the book when it comes out? Just drop me a line at simon@carehomemarketingexpert.com and I’ll let you know as soon as it’s released. 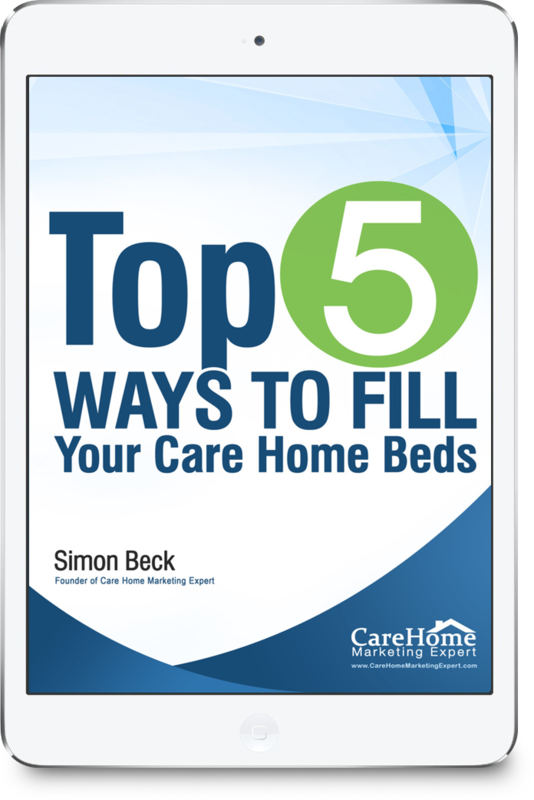 Simon Beck is the founder of Care home Marketing Expert and author of 'Full Beds Forever - How To Market Your Care Home in 3 Simple Steps'. He is also a regular guest speaker at many of the care industry shows such as Naidex, The Care Show & Health+Care.